CLINTON, Miss. 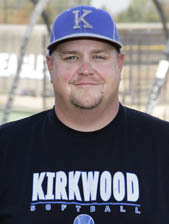 - The Kirkwood softball has drawn the No. 5 seed for the NJCAA Division II national tournament and will face No. 12 seed Kankakee in the opening round Wednesday at 1:30 p.m. at Traceway Park. The DMACC Bears drew the No. 1 in the 16-team field with their perfect 44-0 record, which includes four wins over Kirkwood. Kirkwood and DMACC would meet in the winners bracket semifinals on Friday if both teams win their first two games. Kirkwood is making its fourth straight trip to the national tournament and sixth trip in 11 years under head coach Joe Yegge. The tournament is scheduled to conclude on Saturday.